Nexus 10 no longer in stock on Google Play. Could this be a sign new model coming ?? Sam, 04 Dec 2013Well I am very business orientated so I supposed only the RT or full win will do the job. Wor... moreBuy a laptop. Well I am very business orientated so I supposed only the RT or full win will do the job. Word, excel, powerpoint proper email reconciliation,and adobe acrobat is needed. Need proper memory and storage. Must have USB and 3G,etc. I did look at the latest Ipad air but it did not do anything useful for me. Overall I dont think these devices are useful or worth the money because they are so limited in what they can do. The best buy tablet of the moment is, if you ask me, Asus T100 Transformer Book: full power of Windows 8, new Atom processor, attachable keyboard which transforms it into a notebook, free office, 10-11 hours of battery ... and all at 349$. Now that is an un-beatable offer. Of course, it's not perfect, some may need 3G/4G, a stylus pen/digitizer, maybe 4 GB of RAM and 64 GB of storage, but at 349$ it's a great offer, the power of a laptop plus the portability of a tablet. You should mention on the first page that this guide is limited to ARM-based tablet. Because I don't see any full Windows 8.1 tablet on list except when mentioning Surface 2. Or maybe you still updating the list ? Price is a factor for many people. Apple should look into it. I mean i do like ipads ( don't own though. Have just used n checked them ) but there is no reason to price a nicely built product this much higher than others. Today i was in a store checking ipad mini 2. It was really good but i had to put it down after seeing the price. Its not that i couldn't buy it. Yes ofcourse i could buy it but not at this kind of price. The 16 gb version was costlier by good margin than equally excellent Kindle HDX 32gb. Unbelievable. Bought Kindle. Excellent tablet with superb screen. A bit on heavier side but with money Amazon is charging, these cons doesn't matter at all. Fully satisfied. AnonD-48141, 03 Dec 2013 Windows 8.1 tablets can do it all (not RT) ,buying iPads is super stupidity and Android tabs ... moreI can only assume your naive comment about Android tablets is down to lack of user experience and lack of awareness of the variety of hardware options available in this OS. Perhaps engage brain before commenting in future. Windows 8.1 tablets can do it all (not RT) ,buying iPads is super stupidity and Android tabs are basically plastic toys for kids. Why isn't Nvidia Tegra Note 7 mentioned here? That looks like an awesome offering considering the price point. AnonD-209094, 03 Dec 2013Warning to first time tablet buyers, you may never really use your tablet, especially if you g... morethis is true. ive had an ipad 2 since the day it came out and i rarely use it. Ive literally used it less than 10 times this whole year. After my own (thankfully brief) experience with an RT Surface - I can honesty say that negative comments about Windows are justified, sadly. Anyone considering limiting themselves to such a ridiculously closed system, on any form of hardware,are I have to say i.m.o., mentally defective. Anonymous, 03 Dec 2013You've made a good point there, but a 5 inch screen is still small compared to a 7-10 inch tab... moreThere are some people who can find a tablet useful, sure. Just not anyone I know. As for games, all my nephews, 9 to 12 years old, have iPads for games, sure it's good for them but too often I see them playing on their phones instead, I see no reason why they could not play all the games on the phones, like I do too, even if I have a tablet. Those boys need bigger better smartphones instead of a mediocre experience timeshared between midrange phones and iPads, especially since only one of them have av retina iPad, no denying that iPad 2 has a tragic display quality. Yep, money could have been spent much wiser around here. [deleted post]If you don't count Nook and Kindle Fire that is. Let's not see only what we want to see. AnonD-209094, 03 Dec 2013Warning to first time tablet buyers, you may never really use your tablet, especially if you g... moreYou've made a good point there, but a 5 inch screen is still small compared to a 7-10 inch tablet. 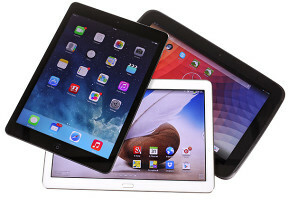 A lot of people use tablets as a second screen while watching TV. For games and services like Netflix, a high res tablet is great.